A fascinating and nostalgic compilation of rider profiles written over a three year period, which originally appeared in Classic Motorcycle magazine, and is now accompanied by a new set of over 100 photographs. All of the riders featured became top achievers in their field, although, for some, it was their first interview. 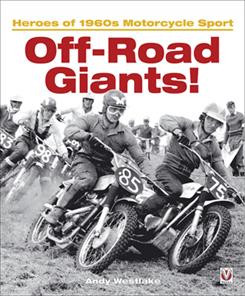 During the 1950s and 60s, scrambling especially drew huge crowds to meetings all across the country, and, thanks to TV coverage such as BBC Grandstand Trophy, and ITVÂ’s World of Sport, many of the competitors featured in this book became household names. Each chapter includes the competition years of the riders, and also gives an overview of their careers, and conveys their enthusiasm for the sport. Custom Chrome Europe BOAR Video 2015: "This Is"